The following views and opinions presented in this post are solely those of the author and do not necessarily represent those of CSE – Canadian Securities Exchange. Love it or hate it, crowdfunding looks like it is here to stay. 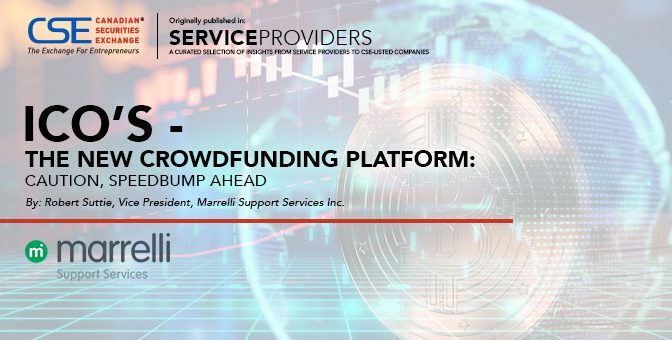 Although the debate on whether crowdfunding is ultimately beneficial or harmful is still ongoing, it appears that major stakeholders from investor groups to securities regulators are beginning to take the idea of crowd-sourced capital raising seriously. Like most promising ideas, the devil, it seems, is in the details. The spirit of crowdfunding espouses greater access to investing opportunities by smaller, non-accredited investors. On the other hand, the rules currently in place are designed around curbing widespread participation in “risky” investments. Striking a balance between investor participation and protection is no easy feat. This balancing act directly impacts industry’s ability to access capital while meeting disclosure requirements. To be considered as an alternative to current methods of capital raising, crowdfunding needs to be in-line with existing controls on capital raising in a heavily regulated and highly structured capital market infrastructure. After all, the premise is that crowdfunding should increase the ‘fairness’ of market participation. In the spirit of ‘fairness’ however, that should mean that crowdfunding doesn’t undermine the existing regulatory checks and balances put in place to protect both investors and industry. Exactly how stakeholders will come to some consensus of balancing participation and protection is still being ironed out. One of the voices in the ongoing conversation about crowdfunding in Canada is the well-respected angel investor, Mike Volker. In a recent blog post – entitled “Crowdfunding = Going Public“, Volker presents a picture of an evolving capital-raising landscape in which crowdfunding will essentially mirror the existing landscape but in a much more fragmented way. Volker’s article highlights the key issues confronting crowdfunding and makes several interesting points. First, it simply is not fair to exclude investors based their economic standing (ie. the 99%), and that fundraising should be more democratic and inclusive of “non-accredited investors”. (Note the recently implemented “Existing Security Holder Exemption” is a step in the right direction). In addition, Volker challenges the assertion that fraud is the bigger culprit for investors losing money, pointing instead to businesses failures that plague early stage companies. Simply put, the overriding risk that investors must take-on when making an investment in an early-stage company is that the company or idea simply won’t succeed. Regardless of fairness or risk, the main point Volker highlights is that capital is being left on the sidelines as a result of the current system. Non-accredited investors are being held out of the market, due to regulation, and not able to participate in the high-risk, high-reward investments extended to the “wealthy” 1%. Letting non-accredited investors participate in earlier stage deals is a key driver behind crowdfunding, but as Volker points out, implementation will be a challenge. Volker tallies all of the above points and comes to the conclusion that innovations at the stock exchange level, similar to what the CSE has undertaken, could be a good answer to the questions that crowdfunding is trying to answer. Specifically, with innovation, existing infrastructure can enable companies to efficiently raise growth capital from the public while enabling all investors with adequate, continuous disclosure within a regulatory framework that is fair to all parties involved. The writing on the wall is clear. There is an appetite by both investors and companies to connect and participate in capital flow in ways that the current system just isn’t providing. Whether this participation need is met by crowdfunding or via existing channels, it is clear that the angels and demons would be better served preparing for change rather than arguing over it.